These are the top 14 things you may want to know before you head to the ancient Nara Deer Park which was established in 1880. Nara Park is huge and one of the most amazing places to visit in Kansai, you need a whole day to spend (at least 6 hours) as it also covers nearby Kasuga Taisha Shrine and the Todaiji Temple. The deer in Nara were thought of as scared animals or other words, the helpers of gods. According to the myth of Kasuga Shine, a god came to Nara riding on the back of the deer. Please do not copy and ride on the deer. It is rude to do that to the helpers of God, the deer now regard as sacred animals and being protected. Deer is called “Shika” in Japanese. Do not feed the deer with human food as it may poison them. Throw your rubbish in the bin provided or bring home as the plastic bags may choke them. There are “Shika Senbei” also known as Deer crackers where you can purchase at 150yen (USD 1.40) for 10pcs sold almost everywhere in Nara Park. The deer crackers are like a treat to the deer and they love it more than anything. The ingredient of the deer crackers is made from rice bran. Some people think it is smelly but I think it is not that bad. You can put the deer cracker in your mouth and feed them. Part of the revenue of the deer crackers is donated back to protect these deer. Most of the deer in Nara Park are very tame, well-behaved and friendly and they like to get close to human to ask for food. If you also travel to Miyajima Island, you will notice the deer there aren’t as friendly as compared over here in Nara Park. The deer in Miyajima don’t even bother to look at you, another word arrogant 🙂 . Nara deer are special, they are down to earth, humble and most importantly super cute! You are welcome to touch the deer and pat them. If you have the deer crackers, they will let you pat them. The minutes the deer crackers finished, they will walk away. Sayonara. Note that only in Nara you are allowed to touch and pat the deer, not in Miyajima Island. You also can’t feed the deer there. 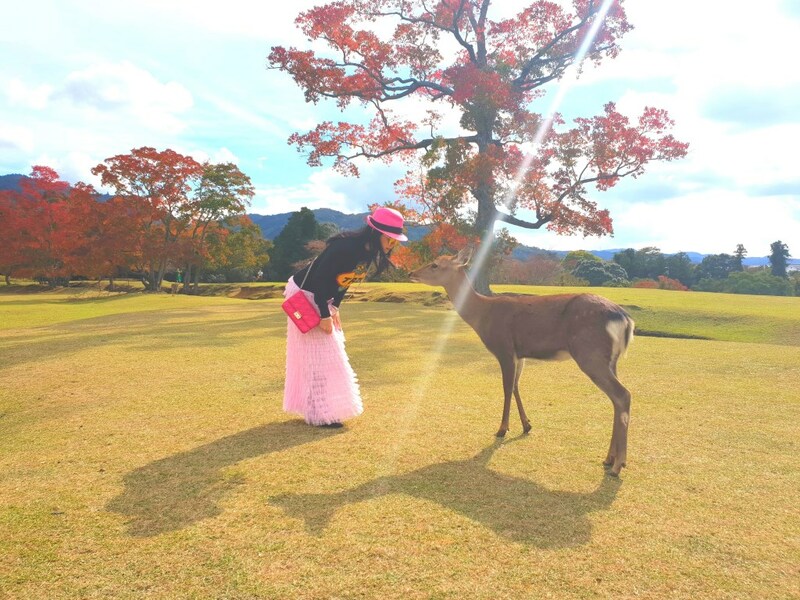 So do take advantage of that, touch and pat the deer in Nara Park and selfie with them. Sometimes they do smile innocently at the camera. 6. Deer in Nara Park will bow back to you -Amazing experience! As I mentioned earlier, the deer in Nar are special. Why? Because the deer in Nara know how to bow to human. I urge you to to be polite with these deities with a bow and see what happen. 7. How to make the deer bow back? Greet them with “Konnichiwa” and at the same time bow to them. Wait for the deer to bow back. 90% the deer will bow back since they know you have the food. Once they bow back, please reward them the deer crackers. It’s similar like training your dog. You may encounter some deer that are a little rough, they may be biting your clothes or bag. I would think that they are just being playful and want to have your attention. Their bite is not painful at all because the deer teeth are not sharp. More like a tickle. However, never leave small children unattended. The deer in Nara are smaller in size compared to the deer in other parts of the world. They are so cute and adorable like “Bambi”. Since as early as the 12th century, the deer have been considered a symbol of luck. People say that when one encounters deer, he or she should bow to them. Do bow and get plenty of luck back home. I noticed the older deer with antlers and darker coat are more aggressive, you can tell by their fiery eyes. However, the antlers of the deer are mostly cut as it is to prevent them from harming the visitors. Even the deer charge at the visitors with their antlers, it still pretty harmless. One of the deer did charge at me but not major happening because the antlers were cut. I would say it is kind of a massage for me at my thigh area. Where is the best spot to shoot pictures with the deer? Go near Ukimido Pavilion area to feed the deer, it has wider spaces and fewer tourists. In autumn, the “Momiji” or red maple leaves are just stunningly beautiful. You will be able to shoot plenty of nice picture with the deer. There are many cute deer-related items selling at the souvenirs stall in Nara such as key chain, towel, purse and many more. My favorite would be the “Deer Poop”. These are the chocolate-covered peanuts snacks to bring home from Nara souvenirs. The name is really interesting and popular among young children. A pack is 350yen (USD 3.20). Buy some to scare your friends back home. Most parking lots charge at around 1000 yen (USD 9.15) but we found a cheaper one called Maruyama Parking cost 800 yen (USD 7.30) for the whole day. Both prices are considering a very good price for the whole day as most parking in Japan are based on hourly basis. Glad the parking in Nara is still very affordable. After you have parked the car, pay first, then the staff will give you a free map for Nara Park. I would say Nara Deer Park is one of the best attraction for me in Kansai area. I love animals and these deer are simply polite, tame, well-behaved and friendly. There are so cute and I could spend hours playing with them and feeding them. The best part is the deer can bow back when you say “konichiwa” and bow to them. This is one of the best experience one should not miss when you are visiting Nara or Kansai. Have you encountered any deer in your country? If yes, are they friendly and can they bow back? This park sounds amazing. I love deer too, it looks like so much fun and also kid-friendly. I bet you can take the family here and make a whole day of it! Nara Deer Park is a great place for the whole family. Not even kids love the deer but adult like me, also enjoy interacting with the deer. Really one of the best experience I have in Japan Kansai Area. I’ld love to visit it sometime. Wow this park looks amazing! I love the way you have put this article together. Very useful! Thanks for your comment. Hope visitors would know what to expect and how to interact with the lovely deer in Nara Park. This looks like it would be so very cool to see! Deer are one of our favorite animals by far. This is my first time to interact with deer and so many of them roaming freely, boundless and together with the human. I didn’t know they are so tame and cute. I have seen and up close the monkey in Bali – super naughty and cheeky and they snatched my glasses. Also the elephants in Chiang Rai Thailand, they are pretty hardworking and brought me to the river ride. But I don’t quite like some of the elephants are being chained at the foot. The Kangaroo in Australia are equally cute too, jumping around and eating from your hand but they don’t bow. The deer in Nara can bow and really funny to see them bow at you. Wow, that sounds like such a wonderful place to visit. Definitely my cup of tea. Beautiful as well! The Nara Deer Park should be the top attraction and not be missed. Love how tame and smart these deer are. These well-behaved deer can bow too, so polite. This is what I love about Japan, maybe Japanese people are mindful and courteous, even their animals! Its a nature’s gift! It<s seems like a lovely and calm place. I have never been to Japan, but I plan to. Maybe I could visit Nara park then. Japan is so beautiful! I can’t wait to visit Nara Park sometime.